The metrics calculations are based on nearly 1.5 billion views, which is twice less than previous month. The stats are collected from 1700+ media servers (including Wowza, Nimble Streamer and Flussonic) so we consider May was a bit "relaxed" comparing to April for our customers. Also, we introduced HTTP origin for "CDN-friendly" outgoing streaming which was adopted by our key customers - this affected stats as well. However, the picture remained pretty much the same. 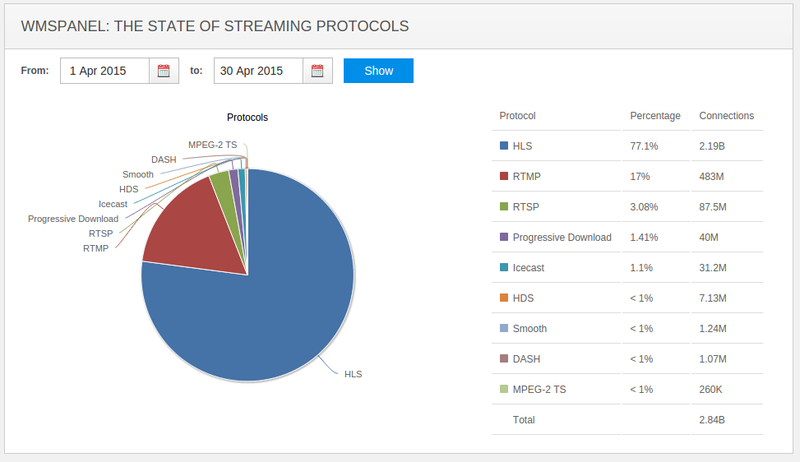 HLS share went down to 72% share while Icecast and MPEG-DASH numbers increased. Check the chart below for more numbers. The State of Streaming Protocols - May 2015. You can compare that to April stats below.